This seems to give a cleaner separation of the low energy/resolution data while keeping enough photons in the higher energy bands to really show the sky. 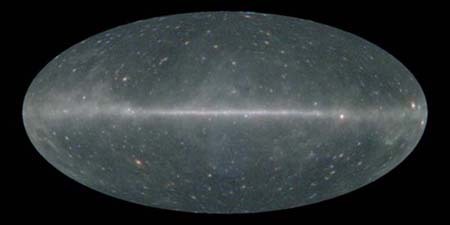 This all sky image shows data from bands 3-5. Harder gamma-ray sources show as blue. A myriad Galactic and high-latitude sources show. We’ve imaginatively named these surveys Fermi 1, 2, 3, 4 and 5 in order of increasing energy. They contain all of the Fermi data available through the beginning of April 2012. The Fermi sky exposure is now considered to be sufficiently uniform that we are providing these surveys as counts maps rather than intensity maps. We’ll be adding exposure information soon. This entry was posted in Documentation, Notices and tagged fermi, surveys. Bookmark the permalink. Hi it’s always a pleasure to read the news on your blog. I also love the astrology and i wanna if I can take some article on your blog to plublish on my blog ? Please feel free to use text from any of our blog articles. Users retain the copyrights to their comments. I love the science of astrology. I will learn in this blog.